Cheim & Read is pleased to announce a landmark exhibition of Hans Hartung’s late paintings, dating from 1987–1989. This is the first showing of Hartung’s works in New York since his controversial 1975 exhibition at the Metropolitan Museum of Art, and focuses on the artistic output of his last years of life. The show will be accompanied by a full color catalogue with an essay by Joe Fyfe. As a child, Hartung tried to capture the quick flash of lightening in order to contain and comprehend its unpredictable energy. Light, space and shadow proved to be life long themes; nature and the cosmos were influential forces. Photography was a helpful aid – Hartung took over 30,000 photographs, mostly recording patterns of light and dark, which he used as references for his work. Though his paintings were decidedly abstract, with seemingly little foundation in representation or figuration, Hartung spent much of his early career copying works by Rembrandt, Goya and Van Gogh. He felt an artist’s single scribbled line could contain enough expressive energy and information for the whole image – such was the authority of an artist’s individual mark. Hartung’s career, especially in his home countries of France and Germany, was successful. His shows and awards were numerous; mid-career, in 1960, he won the Venice Biennale’s International Prize. This also coincided with his transition from pre-planned compositions to paintings improvised directly on the canvas. Exploration and experimentation with various and unusual tools ensued, and included lithography rollers, plant fronds, wheelchair wheels and gardening paraphernalia. Hartung also began to experiment with sprayed paint, using a set up similar to an auto-body shop and eventually appropriating garden hoses and sprayers originally developed for disseminating fertilizer. In 1975, Henry Geldzahler, then the Metropolitan Museum’s curator of contemporary art, organized an exhibition of Hartung’s recent paintings at the museum. 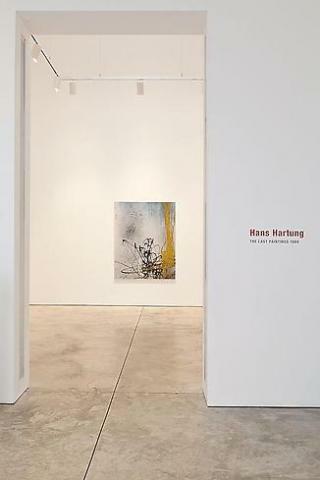 Though several contemporary artists, including Frank Stella and James Rosenquist, reported favorably of the show, it was highly misunderstood, and Hartung’s work was not shown again in New York until now. In an adjacent gallery at Cheim & Read, Abstract Works on Paper from a Private Collection will be exhibited in concurrence with the Hans Hartung show. The dialogue between these works by de Kooning, Mitchell, Kusama, Rothko, Tobey, Twombly among others, and Hartung’s late work will provide an interesting counterpoint.